These questions are not a surprise. Any strategy management concept is quite complex, and without seeing a big picture, the design and later implementation cannot be a success. I’m not pretending to be able to answer these questions in detail and provide detailed how-to information, but at least, my answers will point them to the right direction and focus future research job. I was writing on the similar topic before, but I’d like to return to the topic with more details and examples. Those who have mastered the scorecard skills will find this article especially useful when it is necessary to share the idea of a balanced/business scorecard with some new member of the team. 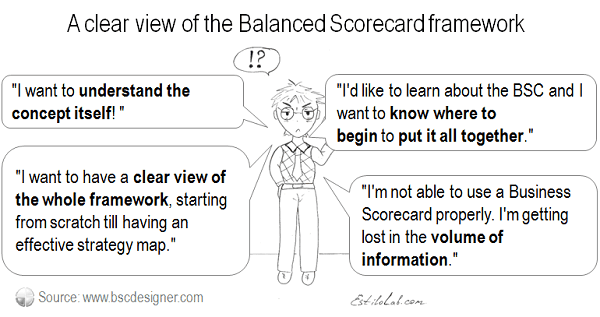 What is Balanced/Business Scorecard all about? I’d say that it is all about strategy. When you have a problem, your resources are unlimited and there is no competition, then you can solve it (at least try and get some feedback about if your initial hypothesis worked or not). When you have a set of interconnected problems (it is a much larger scale than one single problem), and your resources are limited, then solving the problem is not that easy. You need a strategy! The strategy is an answer to “why?” (the reason of the problem) and “how?” (the solution to the problem) question. You need to come up with some ideas that could possibly work out and solve the problem. Let’s call it strategy formulation. You need to describe these ideas in some way that is easy to understand, and to communicate. That is a strategy description. Finally, your company needs to follow the plan and see if it works. I’m sure you already guessed, it is a strategy execution. The primary goal of the Balanced Scorecard or any form of the business scorecard is to help with the description of a strategy. What about strategy formulation and execution? Well, there is nothing new under the sun… There are some generic strategies (including ones suggested in Porter’s works and by Kaplan and Norton, authors of “The strategy focused organization.” These strategies can stimulate your business mind and help you to come up with some insights, so business scorecards can help with strategy formulation as well. On the other hand, a well described strategy is much easier to execute, but you will still need to test all business hypotheses and most likely some of them will fail, but having a good framework certainly helps with strategy execution. 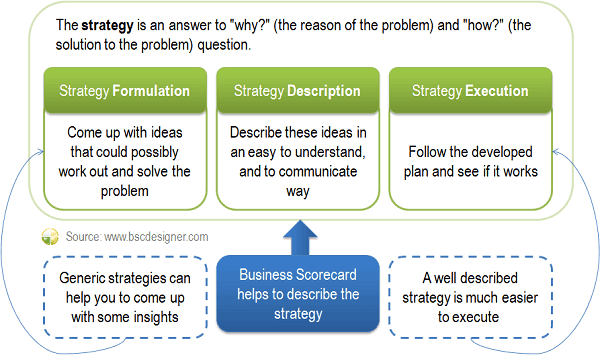 Where to begin the business scorecard project? As you have noticed I was not writing either about KPIs, or about spreadsheets designed in Excel yet. I was writing about the strategy. 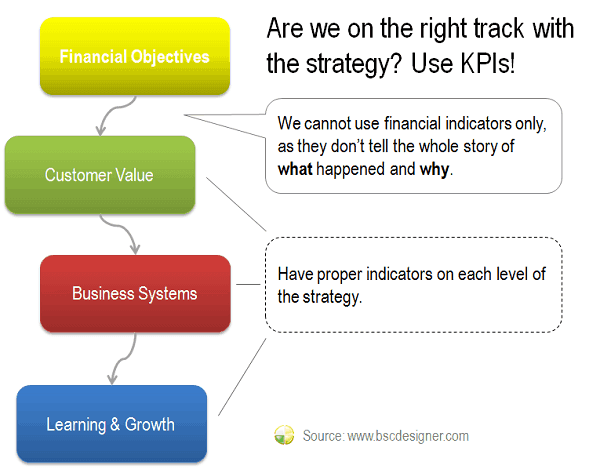 The biggest problem with all failed scorecard projects is that they are focusing too much on KPIs. Once a tremendous amount of time was spend on obtaining required information, and companies failed to make any business use of the scorecard. 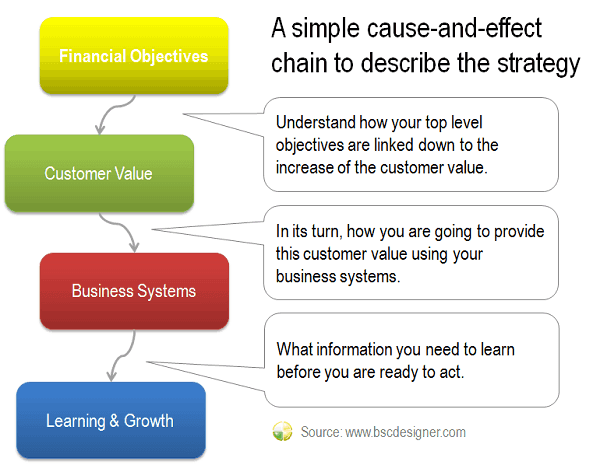 The first thing you need to understand is how your top level objectives (I assume those are some specific profit growth goals) are linked down to the increase of the customer value. In its turn, how you are going to provide this customer value using your business systems and finally, what information you need to learn before you are ready to act. Do you have this chain? We just provided a simple description of the strategy. You can do this on the paper, or use specialized software for strategy mapping. 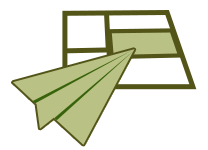 The strategy map is not the end of the strategy description process. Add some KPIs. Having the strategy map is not the end of the process, it’s just the beginning. We are about to finish the description phase of the strategy. One more thing that we need is to find out in some way if we are on the right track with this strategy or not. Ask yourself a question: how do you know that the suggested strategy works? The simplest way is to say: if I see growth in my profits, then it works. It’s true, but things are not that simple. 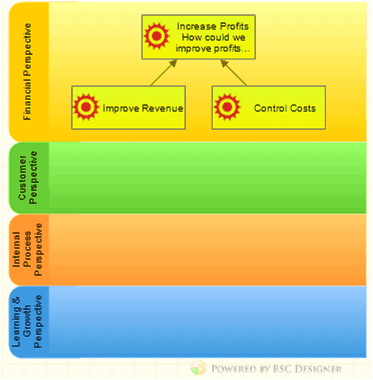 The growth of the profits depends on various aspects of the strategy. For example, you might have an excellent idea about increasing customer value, but one of your business systems was not prepared well for this idea. As result, the strategy failed (you have not seen an increase in your profits). What was the reason for the problem? Was the problem with the specific business system that it failed to deliver expected results, or was the problem with incorrect information that was learned about customers’ buying priorities, or was there any other reason? The example above demonstrates that we cannot use financial indicators only, as they don’t tell the whole story of what happened and why. As a result, you won’t find the real reason for the problem and you won’t solve it. The solution to this is to have proper indicators on each level of the strategy. I’m not calling them KPIs (Key Performance Indicators) yet, because there are some nuances. You’ll need financial indicators, customer-related indicators, indicators for the business systems and learning & growth indicators. If you are on this stage of scorecard development then read Why most KPIs don’t work and what to do about this. Finally, don’t forget that by just describing your intentions in a form of strategy nothing will happen. 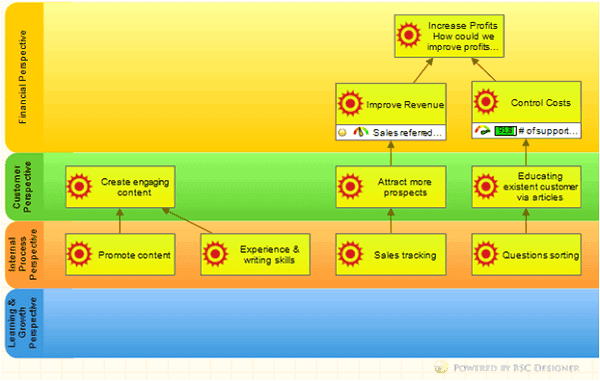 You need to follow the strategy map and KPIs with an action plan. When developing this plan make sure that it is aligned with business objectives and measures that you have found. I hope the ideas above help with you having a clear view of the framework and help to understand the concept itself. Let’s try to come up with a simple example to illustrate what was discussed. 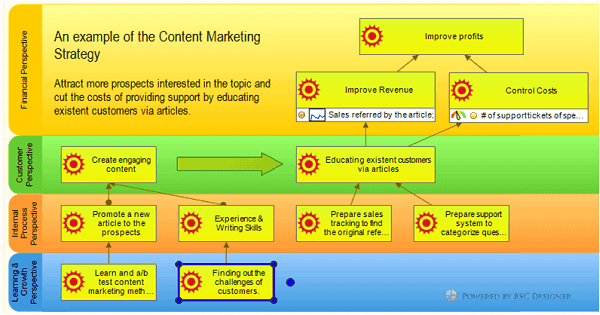 Let’s take this article and its role in content strategy as an example. 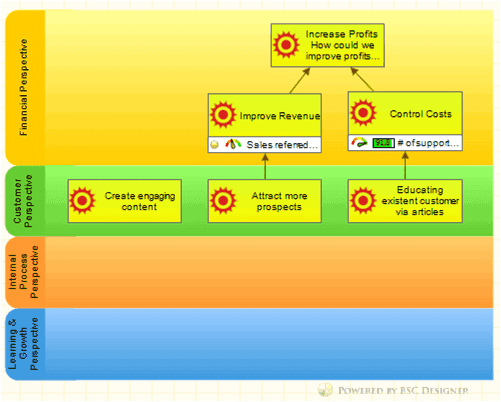 On the top level there is a typical financial goal to increase profits. We can possibly do this in several ways: increase revenue (sell more of our products) and cut the costs. Content Marketing Scorecard online - sign-up with a free account for immediate access to 16 scorecard templates. What’s the value of this article for customers? On one hand the article answered some typical questions that we have every day in our ticket system, on other hand, it educates our prospects about what can be done about the Balanced Scorecard. 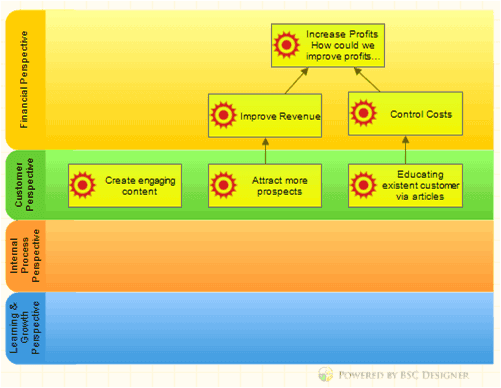 Some of those who read an article could try the trial version of BSC Designer software, learn all its benefits for strategy maps and scorecard design and decide to buy it. Or these who already use some type of scorecard software, but struggle with KPIs, might buy our KPI Training. But all this will happen only if our prospects are able to find an article with search engines. How are we going to know that this approach is working? Looks logical for now. What business systems do we need to do this? There should be some writing skills and experience that we can share. It is also important to have a business system that can track back certain orders and find the original referrer of the customer so that we can find the value of KPI 1. It is important to have a support system where questions are not just answered, but are categorized accordingly to some rules so that we could find out the value of KPI 2. 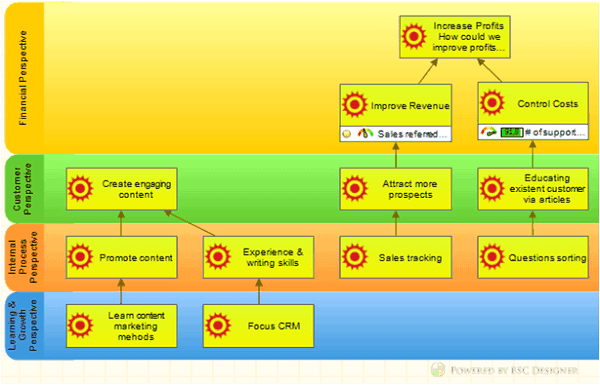 And the most important business system is one that will promote a new article to the prospects. Finally, before doing all this, what information do we need to have about the customers? Obviously, we need to understand what their problems are, because it makes sense writing about the real world problems, not about invented ones. It means that we need to focus our learning systems (CRMs and other means to listen to the customer) on finding out what challenges our customers face. That’s it. Scorecard is finished. We need to act respectively. Once we know what customer’s main challenges are, one can write an article. In some time, we will see how many people can find this article with search engines and how many times it was recommended for reading by our support staff. In about 2-3 months we will be able to estimate the ultimate impact of this article on the sales and operational costs. This information can be used then to correct the content strategy if needed. Here is how the final map looks like. You will find this project in “Samples” folder of the BSC Designer. You can try BSC Designer right now. What do you think about the Balanced Scorecard now? Did this article help to see the big picture of the concept? Was the example useful? Content Marketing Scorecard discussed in this article as a starting template for your own scorecard!